FILE - A woman walks down a stairway against the backdrop of high-rise apartment buildings in Hong Kong. A year after pro-democracy protests filled the streets of Hong Kong, the city has become a target of multiple, and sophisticated, cyber attacks. Hong Kong cyber security watchdog Hong Kong Computer Emergency Response Team said there has been a 38 percent rise in hacking attacks since last year. Nicholas Thomas, a Professor at the City University of Hong Kong, said it is unclear who is behind these cyber attacks. “With what’s been going on the Hong Kong side, there’s been no direct tie to the Chinese government, or any government agencies. That is possible of course. But this could equally be Chinese hacker groups who are displaying some nationalist tendencies in cyberspace and doing this under their own steam,” said Thomas. Since August of last year there have been more than 1,175 phishing attacks, where users’ data and computers are compromised after clicking on an attachment to an email. But cyber attacks in the city have not been limited to phishing methods. Western security experts say hackers are using more sophisticated techniques, such as Google Drive and Dropbox to hack into democracy activists’ devices. Hackers are also using “white lists,” which compromise the data of certain visitors to some websites. “What we do know is it’s a pretty sophisticated attack that is taking place. They are using Dropbox and Google Drive to install malware. They are using the cloud aspect of Google Drive and Dropbox to mask what they’re actually doing,” said Thomas. Victims of the recent spate of cyber attacks include activists, university professors and journalists, and western security firms such as FireEye, say the sophisticated hacking techniques are commonly used by China and Russia. Tom Grundy, the founder of Hong Kong Free Press, said his website came under attack just before its launch. “It was a DDOS, a denial of service, attack, a surge of traffic that seemingly had a human being behind it. Now I think we are probably the most secure website in Hong Kong, and we recognize that other news outlets, such as Apple Daily have been attacked much more viciously. But Hong Kong is supposed to be the first and last bastion of freedom of expression, freedom of speech and of the press in greater China. So a lot of us in the media and beyond are concerned about this,” said Grundy. 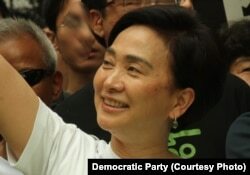 FILE - Emily Lau, a Hong Kong politician and member of the Legislative Council. It is cyberattacks like these that have made Hong Kong the most targeted region in Asia since last year’s umbrella movement, according to some security firms. Hong Kong’s Democratic Party says it has been the victim of multiple hacking attacks over the last year. For lawmaker Emily Lau, surveillance has become a way of life. “Surveillance, I always feel that I am [under surveillance], even now while I am talking to you, and of course I have nothing to hide. I always say that my life is an open book, and I walk around Hong Kong on my own,” said Lau. It is an attitude that may be necessary for many of Hong Kong’s pro-democracy activists to adopt.